I originally titled this blog, “The Corresponding Theories of Nominative Determinism and the Astrology Phenomenon.” But then I realized that more people would read it if I just got to the point and called the blog article what it really is, “Astrology is Really Just Hypnosis.” In this article, I will show you how astrology really works. The world is full of coincidence, but some things happen so often it is hard to assume that they only happen by chance. Sigmund Freud’s name meant “joy” long before he dedicated his life’s work to researching the brain’s pleasure center. Meteorologist Larry Sprinkle spent 25 years delivering weather reports to the people of Charlotte, North Carolina. Your daily horoscope may hit the nail on the head more often than not, and your perfect partner may be exactly the best “suggested match” for your zodiac sign. You may notice that your friend born in Sagittarius is the epitome of what a Sagittarius should be. The question is: why do these things happen so often? Is the answer in the alignment of the stars? Or perhaps there is a different scientific factor involved. Is it possible that we hypnotize ourselves and create these “coincidences”? 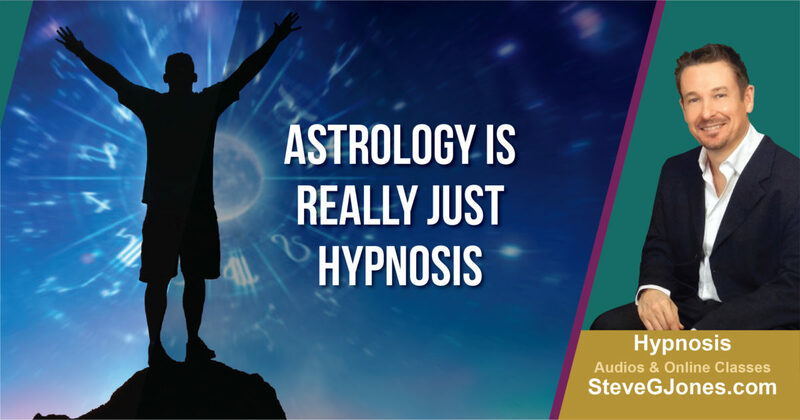 Scientists from all fields have dedicated time studying these phenomenon such as “nominative determinism” and the pseudoscience of astrology, and though there have been no complete studies to discover any hard evidence, the topics have been popular for quite some time. While multiple theories have existed, the idea that these coincidences exist due to a hypnotic effect is likely. Nominative determinism is a frequently assessed scientific hypothesis that made its first appearance in the British magazine “New Scientist” in December of 1994. The term, which literally translates to “name driven outcome” refers to the idea that a person’s surname (and sometimes given name) tends to determine their future profession or work path. The pattern was so common, in fact, that the magazine tried to ban the topic, but was unsuccessful due to the constant flow of suggestions sent in by readers and popular demand. The magazine has published countless articles listing examples of the name phenomenon since. While the 1994 publication of “New Scientist” was the first to use the term “nominative determinism,” the idea had been suggested by many cultures and scientists before. Dating as far back to ancient Roman times, the idea was suggested in the common term “Nomen est omen,” which means, “The name is a sign.” This became an incredibly accepted truth and a popular household phrase, so much so that it was adopted by many other languages and cultures after. The idea is referenced again in 1970 by philologist Roberta Frank when she speaks of the idea of “onomastic determinism,” or how the history and origin of a name can likely determine one’s future outcomes. The phrase varies from the often confused term “aptronym” (and the similar term namephreak) in that an aptronym is described merely as coincidence with no scientific evidence to back it up. Examples of nominative determinism are common throughout the modern world and throughout history. The high volume of occurrences is what makes it easier to see this as a scientific pattern than just mere coincidence. One example includes Sarah Blizzard, who was a weather girl for BBC News. Other famous examples include Usain Bolt, regarded as the fastest man who ever lived, and Thomas Crapper, a plumber who invented the modern toilet. Other relevant examples include Igor Judge, who became Lord Chief Justice of England and Wales and Mounted Canadian Police Officer named Law Power. Some of these names are just too convenient to be true, but they are. The occurrence happens often enough that hundreds of publications have featured new names and examples of the phenomenon, which leads scientists to believe that something larger than coincidence is at work. There are two commonly accepted explanations for the frequent occurrence of nominative determinism. The first refers to the order of naming throughout history, citing times when surnames were given based on a person’s profession. Common examples of this include the surname “Taylor” given to tailors and “Smith” given to blacksmiths. Other examples include “Miller” given to a person who grinds grain or “Tanner” for a person who cures and tans leather. In the age when names were assigned according to a person’s profession, it was also customary to pass down your profession or trade to your sons, meaning that along with the name “Taylor” came a line of men who had practiced dexterity and attention to detail. The family of “Smith” may have strength and hand-eye coordination. The idea is that this pattern of naming and career choice has made people of particular lineages more apt to do certain jobs. The second explanation, and perhaps more favorable since this old naming technique has long been outdated, is called “implicit egotism.” This theory suggests that people have become familiar with their name, and therefore have chosen a profession based on said name without notice. While nominative determinism has been a popular idea throughout the world of science for many years, the concept is rather complex and therefore, would require evidence that is difficult, or impossible, to collect. Therefore, nominative determinism remains a hypothesis amongst scientist. However, it seems as though there is plenty of regular evidence to support this hypothesis. The idea of implicit egotism refers to people’s natural tendencies to gravitate towards things and ideas that are reflective of the self. This idea is often used in reference to relationships and choosing partners. For example, it implies that people choose partners who possess qualities, interests, and habits that are similar to their own due to comfort and familiarity. However, the idea of implicit egotism also applies to many other areas of life, including the location we choose to live, our favorite authors and artists, our favorite brand names, and even our favorite, foods, letters, and numbers. It is suggested that people tend to prefer the letters that are in their name and the numbers that are in their birthdate or long time addresses and phone numbers. According to the theory of implicit egotism, we are likely to gravitate towards professions that match our name because we have lived with our name our entire life, and have therefore become familiar and comfortable with it and ideas surrounding it. The theory suggests that these choices that reflect one’s self are not conscious choices, but are instead decisions made by the subconscious mind on a daily basis, implying that people instinctively choose a field of work that is “familiar” to them. This is why the theory of “implicit egotism” so accurately supports the idea of “nominative determinism,” implying that the person’s future profession is not a choice, but rather a predestined course determined by their name. In psychology, there are two parts to a functioning brain, including the “conscious” and the “subconscious.” The subconscious portion of your brain does not understand or produce reason or logic, and it is not responsible for “active” thinking. Instead, the subconscious is kind of like a “background absorber” that collects data and material from everyday stimuli. The subconscious mind processes this data incredibly quickly. In fact, before you even make a conscious realization of an event, your subconscious, if functioning effectively, has processed the occurrence thousands of times and has already incited a reaction. Your subconscious reaction is often referred to as “instinctive behavior.” This part of your brain controls your involuntary actions, like blinking, breathing, and circulation. When you are cut or burned, the subconscious brain tells your cells to react accordingly, causing your skin to automatically begin healing. It controls most nerve activity and therefore is responsible for any pain you feel. Your subconscious controls nervous habits, addiction, and anxious, paranoid, or depressed thoughts. It also determines what types of things we have a particular attraction to, things we dislike, and our sexual preferences. Any decision that is not a “conscious decision” is controlled by your subconscious. The subconscious portion of your brain allows the mind to be subject to the influence of suggestion, which means accessing the subconscious is the key to hypnosis. Self-hypnosis is a common method of hypnotherapy used to treat a variety of ailments and conditions, including anxiety and depression, OCD, and sleeping disorders. When this form of treatment is repeated frequently, it can also be used to help break habits, such as smoking, drinking, or overeating, and as a form of pain management, including before surgeries and during childbirth. Hypnotism was first introduced by renowned surgeon and scientist James Braid in 1841, and he began tinkering with and prescribing the idea of “self-hypnosis” to his patients about two years later. The method has been frequently taught and prescribed to patients by hypnotherapists ever since. The idea is that patients can consciously put themselves into the relaxed state of hypnosis, allowing their subconscious (which controls pain, addiction, anxious thoughts, etc.) to be altered by the power of suggestion. In theory, the idea of nominative determinism could refer to a form of hypnosis itself, but rather than being consciously hypnotized, the person may be subconsciously hypnotized throughout their lifetime. Being surrounded by and familiar with the name could lead to subconsciously making decisions related to the name, including a fitting career choice. Is Accidental Self Hypnosis Possible? Many people have claimed to have “accidentally” hypnotized themselves by listening to hypnosis while unaware, but the evidence as to whether this type of hypnosis is possible is inconclusive. However, one idea surrounding hypnotherapy lies in the power of affirmations. An affirmation is a short phrase that represents a positive idea. Generally, affirmations are about one’s self and directed at one’s self on a regular, daily basis. The idea is that affirmations are effective because the more often you hear this positive phrase about yourself, the more likely you are to conform to the idea. While saying these phrases once will not help an alcoholic become immediately sober, hearing this phrase repeatedly may help them to slowly edge away from their alcohol dependency. The idea is that the repeated phrase will help strengthen chemical pathways in the brain and build self-confidence, therefore allowing the person to trust themselves and the affirmation more effectively. This can aid in changing behaviors and habits. If this type of “self-hypnosis” works just through hearing a few phrases repeated every day, then the idea of being hypnotized by other outside stimuli is not so far-fetched. Emile Coue is the French psychologist and pharmacist who are credited with originally implementing the idea of affirmations, which he called “self-suggestion.” He identified two different types of self-suggestion, including “reflective suggestion” and “spontaneous suggestion.” Reflective suggestion refers to the conscious attempt to use these affirmative phrases to create a change in behavior. Spontaneous suggestion, however, refers to unconscious elements that may alter patterns. While Coue may have been referring to dreams and involuntary actions and emotions, it is easy to apply this idea of “spontaneous suggestion” to other areas, making the idea of accidental hypnosis more conceivable. Astrology is a widespread and commonly accepted theory that outlines people’s personality traits and characteristics. According to the idea of “self-hypnosis,” particularly in relation to the idea of affirmations, people could be just as easily influenced by reading their horoscopes daily. Due to modern technology, your daily horoscope, information about how your zodiac sign relates to your career or love life, or viral articles suggesting your personality traits according to your sign are easily accessible. This means that “accidentally” hypnotizing yourself to follow these zodiac suggestions is totally plausible. These ideas of subconscious hypnosis and “determinism” can easily be connected to another common “personality trait” phenomenon. Astrology has long been considered a pseudoscience due to its inability to be properly tested (much like nominative determinism), but that has not stopped people from firmly following the traditions, systems, and beliefs of psychological astrology. In fact, many people tend to empathize with their zodiac sign’s suggested personality traits and are able to relate with their daily horoscope. The reason for this could be closely related to the “hypnosis and implicit egotism” theories behind nominative determinism. One idea suggests that people are introduced to their zodiac signs at a young age. After becoming familiar with the idea of astrology and with specific traits associated with your zodiac sign, it is possible that you subconsciously make changes to make yourself closer relate to those traits. This idea could be due to the “Barnum Effect” which suggest that people take vague and generalized descriptions and ideas about their personality that are said to be “tailored to them” to be true. Because people are actively looking for a correlation between their personality and their zodiac signs traits, they are more apt to believe the listed traits and subconsciously “create” the correspondence in their heads. This could suggest why so many people are easily drawn to the study of astrology, and why so many people frequently check their horoscopes or relate themselves to their sign. For instance, a young person reading about their “Aquarius” sign may find that it suggests that they are trustworthy, affectionate, and unpredictable. Because the person associates himself with the Aquarius sign, it is possible that they also believe that they carry these qualities. A person born in Libra may read that their sign is often associated with being cooperative, social-minded, and successful in relationships and become determined to make their relationship work or more easily believe in their happy marriage. The information is subconsciously absorbed, often as a true statement, and the person’s personality and qualities may adapt to fit the suggested traits more closely over time. This could simply be a form of self-hypnosis. Because the study of astrology is so diverse, it is possible that it impacts people in a variety of different ways. For instance, if you look up your sign, you may find research suggesting the best career paths for you. Astrologists suggest that Virgo’s are detail oriented and accurate, therefore some career paths that are recommended for Virgo’s include tax assessing, welding, and systems analyst, while suggested paths for an outgoing, personable, and goal-oriented Leo include careers as an actor, publicist, or motivational speaker. A person reading this at a young age may begin to subconsciously relate to or gain interest in these suggested fields, thus making them a better fit for these jobs in the future. A study examining 39 of the first 44 American Presidents (some were excluded due to a discrepancy in their birth date and time, and Grover Cleveland was only counted once, despite his reelection) shows that 15 Presidents were either a Capricorn or Cancer. Capricorn personality traits may suggest that they are responsible and good managers who are concentrated and resourceful in their careers and like to help others. Cancer’s traits read that they are often highly imaginative and persuasive, good at managing time and money, and goes as far as to suggest that a Cancer often makes for a good politician. When examining the top 100 people that made Forbes’ 2016 List of American Billionaires, it is notable that 25% of them are either a Taurus or Aries. Taurus personality traits suggest that they are grounded and determined in terms of their career and interested in material gain, while Aries traits often read that they are intelligent, natural born leaders who have trouble “working for” a boss. Is it possible that these suggested traits could lead to so much financial gain? Through the power of subconscious suggestion and hypnosis, probably so. A look at the 2012 Olympic swim team revealed that 13 of 49 members were Pisces, with the next highest common sign being Scorpio at only 6 members. 13 out of 49 is a whopping 26.5%, in incredibly high number for only one out of 12 possible zodiac signs. The Pisces symbol features a pair of fish and the personality traits often lists swimming as a common interest among the zodiac sign. Is Astrology just Hypnotizing People? These “coincidental” phenomenons however, may present other evidence. In the case of both nominative determinism and astrological similarities, hypnosis is a likely explanation. However, this would imply that people are subconsciously hypnotized by their daily stimuli, causing them to make predictable or relatable decisions in the future. This may be why so many “artistic, curious, and open-minded” Gemini’s turn out to writers and artists. Is it possible that astrology provides a hypnotic effect that makes it so relatable for the average person? According to available evidence, the idea is entirely feasible.